USASF membership is open to every company. However, not every company member will automatically qualify to conduct sanctioned competitions and/or give Dance Worlds bids. If a company is a Tier 1 or Tier 2 USASF Member paying dues, then fees are waived for Dance. If a company is not a Tier 1 or Tier 2 USASF Member paying dues, they would have to pay Tier dues. USASF Company Member Application that includes the agreement: 1) with the mission of the USASF, 2) the USASF rules, safety rule and sanctioning standards, and 3) conducting business in a way that will support and further the mission of the USASF and 4) the terms and conditions of the USASF Company Member Agreement. Companies giving any Worlds bids must fully comply with the USASF Dance Sanctioning Minimum Standards. The date the company or sister company became a member of the USASF. Sister company is defined as a company who has a cheer counterpart that already gives USASF Cheer bids. Each company can only have one sister dance company. Companies giving any Worlds bids must fully comply with the Worlds logo requirements, including the proper usage of specific partially paid bid logos. The companies that give Dance Worlds bids must have one Dance National Championship or designate one of their major competitions as their "national championship" for purposes of Dance Worlds bids. The selected "national championship" must have had a minimum of 30 All Star Dance Team performances in an All Star Division participating at the same National competition in the prior year to qualify. This competition must have a minimum of two years history. If the selected "national championship" had 30 or more All Star Dance performances competed at the same prior year competition, the company can award one (1) partially paid bid at their selected national event. The partial paid bid amount will be $325 per athlete plus two coaches, up to $5,000 maximum or $3,500 minimum amount. If the selected "national championship" had 40 or more All Star Dance performances competed at the same prior year competition, the company can award up to three (2) partially paid bids at their selected national event. The partial paid bid amount will be $325 per athlete plus two coaches, up to $5,000 maximum or $3,500 minimum amount. If the selected "national championship" had 50 or more All Star Dance performances competed at the same prior year competition, the company can award up to three (3) partially paid bids at their selected national event. The partial paid bid amount will be $325 per athlete plus two coaches, up to $5,000 maximum or $3,500 minimum amount. If the selected "national championship" had 75 or more All Star Dance performances competed at the same prior year competition, the company can award up to four (4) partially paid bids at their selected national event The partial paid bid amount will be $325 per athlete plus two coaches, up to $5,000 maximum or $3,500 minimum amount. If the selected "national championship" had 100 or more All Star Dance performances competed at the same prior year competition, the company can award up to five (5) partially paid bids at their selected national event. The partial paid bid amount will be $325 per athlete plus two coaches, up to $5,000 maximum or $3,500 minimum amount. If the selected "national championship" had over 100 All Star Dance performances competed at the same prior year competition, the company can award one (1) partially paid bid for every 25 All Star Dance performances over 100, at their selected national event. The partial paid bid amount will be $325 per athlete plus two coaches, up to $5,000 maximum or $3,500 minimum amount. Note: for every additional Partial Paid bid, 2 more At Large bids can be awarded. Up to two Exhibition performances may count in the number of performances for awarding bids. A performance is defined as a competition performance that is ranked in a USASF category/division. A maximum of two performances may be counted (i.e. Exhibition performances) that are not ranked in a USASF category/division when determining the number of Partial Paid bids an Event Producer may award. Can display "Road to Worlds" at all events. Get venue signage at the Dance Worlds venue. Get 1⁄4 page ad free in Worlds program. 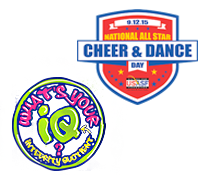 Can display USASF's exclusive logos at events, on printed materials and web site in approved formats. Are listed and linked on the USASF web site. Are eligible to be included in USASF Dance Rules Processes. A program may be awarded multiple bids however each program may only receive one bid per division and category. If a team does not accept the partially paid, the company must award the bid to another team. If a team does not accept an at large bid the company may only award the bid to another team within 96 hours from the end of their Worlds bid event.